This coupon portal PHP script is the one of the best ready-made discount coupon script which has the most effective method of earning affiliate commissions. This is a fantastic script for starting a discount coupon website. This is the best option to buy our script. You can contribute the best coupons and offers to your customers. Since, our PHP coupon script will rejuvenate with discounts and coupons every day. The additional features of this deal software has a responsive design, user-friendly, Google optimization, newsletter, progressive CMS management, advanced search engine, feedback updater, rejuvenated coupon details, advertising management with current status, attractive membership, plan management, listing management, dashboard option for user, PayPal payment integration favorite listing and advanced blog system. The peak benefit of this PHP coupon code script is managing the coupon details with brief description and you can customize the whole website as per your needs if you have appropriate technical knowledge. The coupon management is optimized by you and you have many revenue benefits via this coupon script. Through this script, your customers can save their time because our team has established the progressive search option and sorting option. You can be permutated in listing details and authorize the banner advertisement details via membership plan. We know that getting your website to the users is necessary which is why we have made our script to be SEO-friendly by optimizing it in accordance Google standards making your website come on top of the search results, thereby increasing your website’s ranking and produce more organic search results from the search engines. We also provide 1 year of technical support, free updates for the source code for 6 months, and the product is absolutely brand-free. We will provide you with the full source code upon purchase of the script and your website will go live within the next 24 hours. If you still have any queries, feel free to contact us. We would be happy to help you out. Coupon website script looks beautiful, has decent features, it is still evolving through excellent support!! I am very happy with the support they are providing. Along with the theme support, they rectified the problem and guided me with support team. 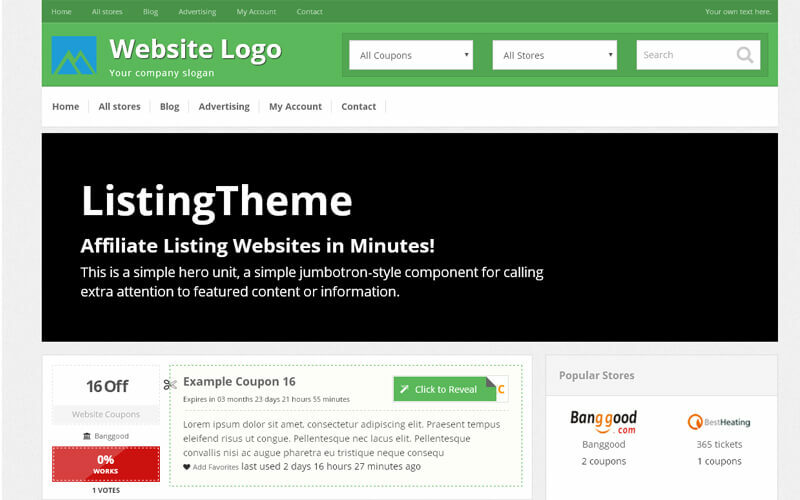 I am happy to purchase this Coupon script and it is well designed template with good amount of features!!!!! !